Well, that wasn't much of a winter. And we had very few days where the temperature dipped below freezing. Not that I'm complaining. I'm not much of a fan of cold weather. But all that warm and unseasonable weather has messed with Mother Nature's clock. Here in New Jersey, everything is about two weeks ahead of itself. Plants are blooming early. Spring is popping out all over, and way too soon. Though you may not have heard of New Jersey's Cherry Blossom Festival, there's one every year at Branch Brook Park in Newark; the park features 4300 cherry trees, 600 more than Washington D.C. This year, organizers were worried that the trees would be finished blooming before the festival even began. (Though they made sure everyone knew there were enough late bloomers that there would still be some blossoms to see.) They're talking about moving next year's festival up by a week or two. Not that I'm complaining. I love seeing the first touches of green, telling me warm weather, flowers, hummingbirds and butterflies are on their way. But there's a cost--or at least a risk. You'd think that warm weather is great for our friends the honeybees. But apparently if it doesn't get cold and stay cold, the bees stay active. And when they stay active, they eat. And they didn't really plan on eating all through the winter. So apparently, many honeybee hives have been lost as the poor litttle pollinators starved to death when they ran out of food. And on top of that, last week, we had a hard frost, a killing frost, that could have decimated the orchards of the Garden State. 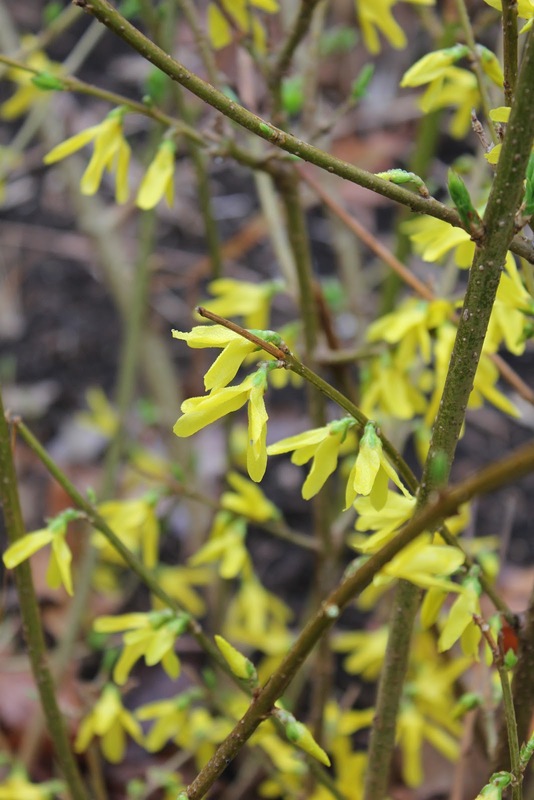 And all those early buds and leaves could have left us gardeners with blossom-less bushes, or worse, dead plants. So in addition to figuring out how to protect my tender spring shoots from rampaging dog paws, I had to figure out how to protect my early rising plants and leaves. Not that I'm complaining. Sometimes the fun of being a gardener is taking on the challenges thrown at you, and even sometimes succeeding. 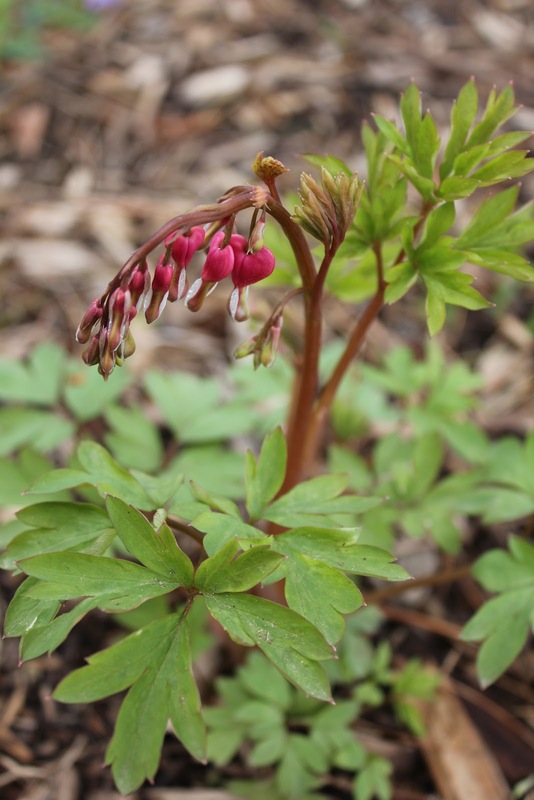 Below are some pictures from my early spring garden; here's hoping everything survived the hard frost of last week--and the few cold nights they're predicting for this week. 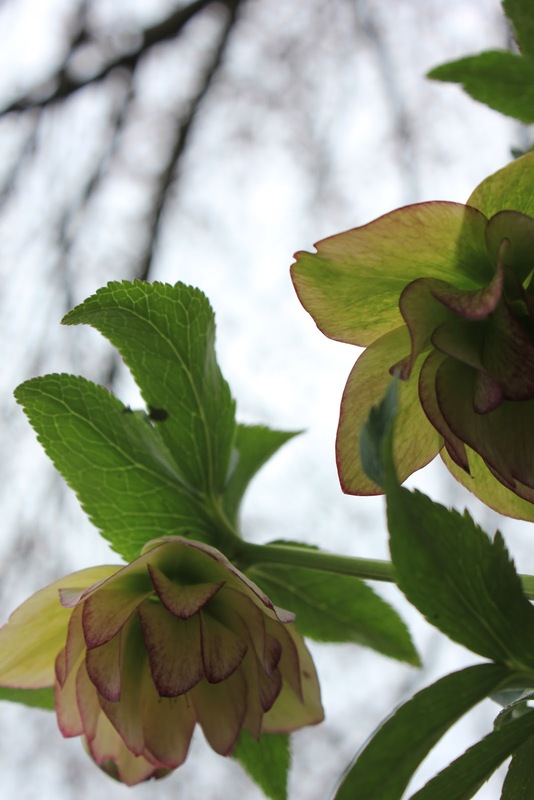 Hellebores: a recent discovery, these have quickly become favorites of mine. 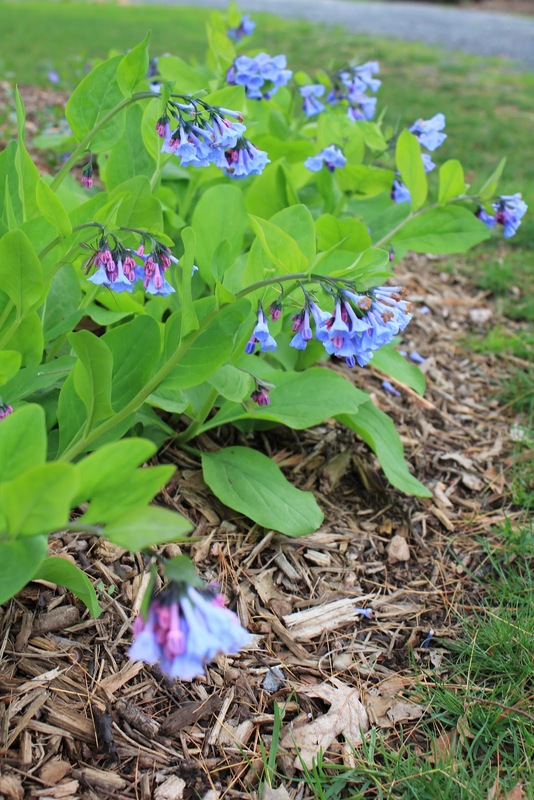 They are the very first to bloom, they don't care about the cold, they love shade, and the best part: they are absolutely deer proof! Crocus are another favorite, as they bloom early, creating small spots of color on the ground. On a warm day, the first honeybee of the season came by for a nibble. I'm happy to see him, and hope he eats his fill. Running through my crocus, Jasper demonstrates why I've had to be creative in protecting my plant from marauding paws. 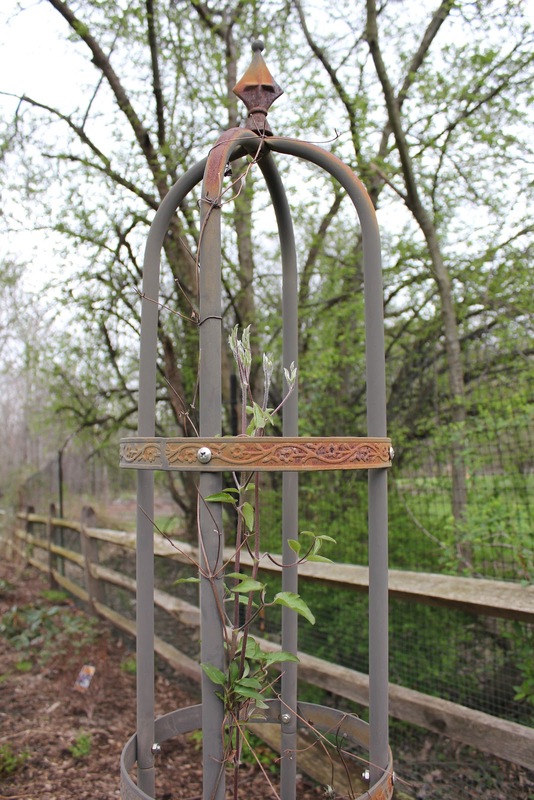 In addition to the stick fence I have around my perennial garden, I also put up these (admittedly ugly) wire barriers throughout my garden beds. They create a series of obstacles that make it less fun for dogs to barrel through. It seems to be working. Forsythia: supposedly deer resistant, but not in my neighborhood. Here it is deer candy. I use a special minty anti-deer spray that seems to hold them off--as long as I spray often during the spring. Lilah traipses by grape hyacinths and daffodils. The rock border is another arrow in my quiver of tricks to protect my plants from pups. The dogs jump over the small barrier, and go right over the plants. Susan: 1, Dogs: 0. Usually. Except when there is a particularly intense chase. Or a squirrel. Then, all bets are off. The magnolia, in full bloom, adds a touch of early color to my home. 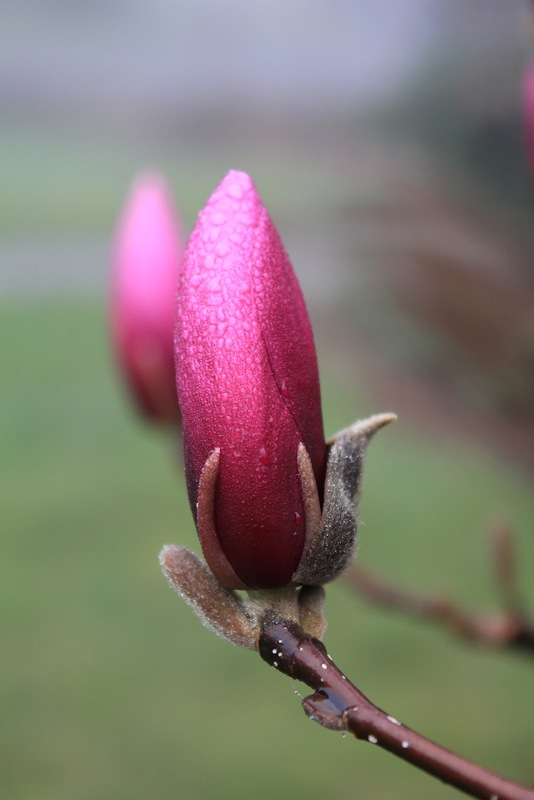 I love the simple perfection of a single magnolia blossom. I have several varieties of hosta in the shadier parts of my garden. Hostas only were able to join my garden when we put up a deer fence. 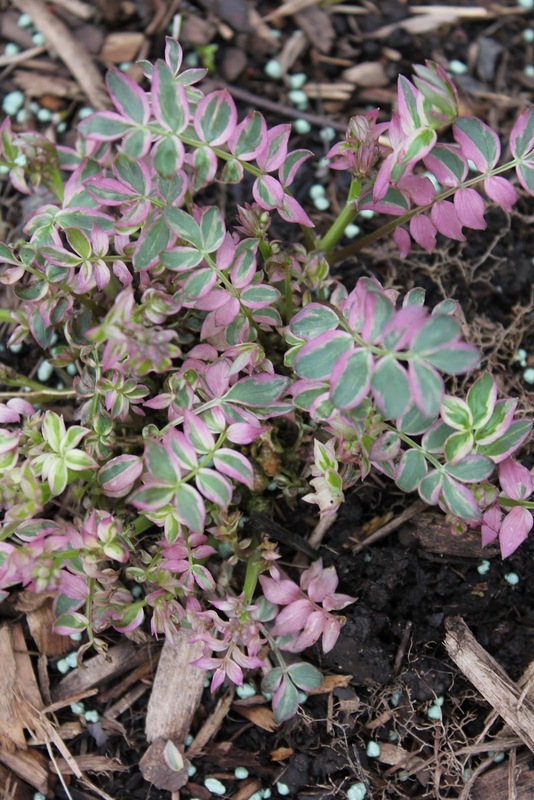 The leaves of bleeding hearts capture droplets. Sometimes I'm amazed at how the structures of leaves on so many plants come up with different solutions to gather and flow water. 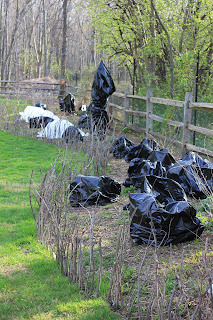 Preparing for the freeze, my garden looked like a dumping ground. 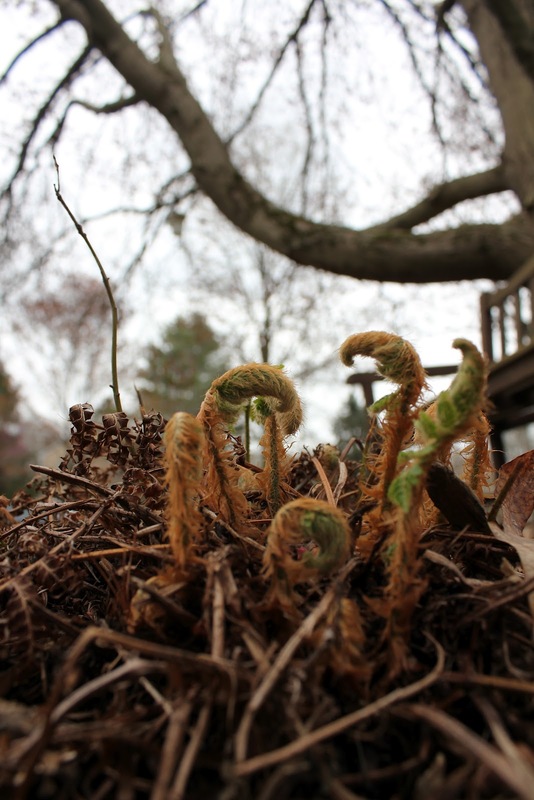 Under those garbage bags, tiny sproutlings were huddled, hoping to use the earth's warmth to avoid the killing frost. 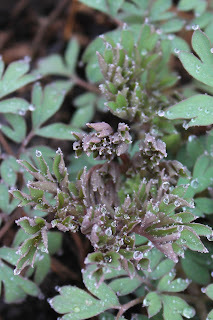 While I think most of my plants survived, many were damaged. Here, black leaves signal cell death on one of my hydrangeas. This is the second time I've tried Jacob's Ladder. Yet the first time it came back. So I'm hoping it survives. 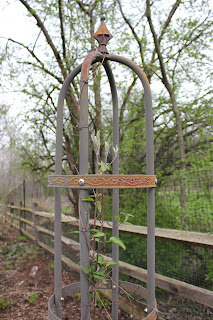 I'm a big fan of vines like the clematis shown here, and honeysuckle. I've been training several varieties to climb the deer fence. 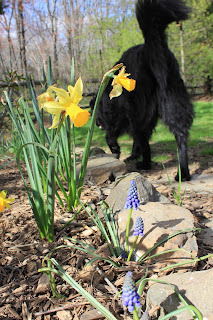 That said, I try not to plant too many things right next to it; if I leave a trail for the dogs to run along, they're less apt to charge through the center of my garden bed. 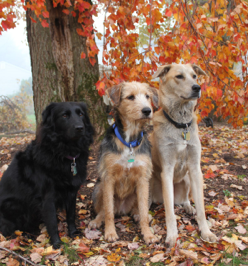 Usually, the only reason they're in the garden is because there's a Deer or a Squirrel on the Other Side of the Fence and it Must Be Attended To. The path allows for that. 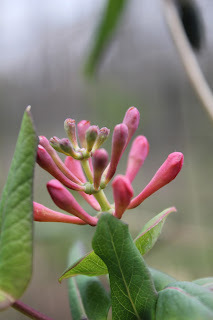 A variety of honeysuckle, about to bloom. This one features gorgeous pinky orange blossoms. 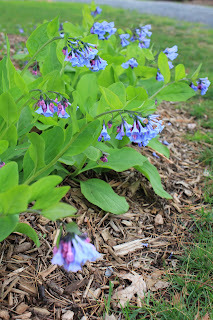 Virginia Bluebells, a New Jersey native. I've lost these nearly every year--to overly aggressive landscapers. This year, Brian (and my daughter's boyfriend Luke) did the spring cleanup and the result is the bluebell display I've always wanted. 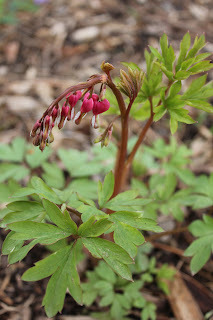 Bleeding Hearts in my front yard are already setting up blooms. These have to be sprayed to prevent deer nibbling as well. 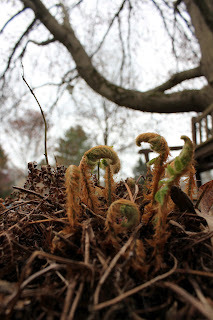 There are several varieties of ferns in my front yard. They have a unique way of curling up out of the ground. 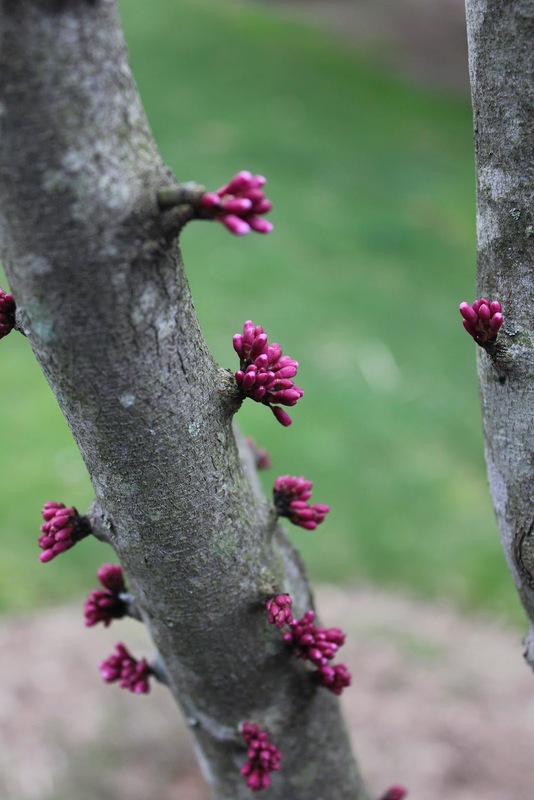 The redbud is unusual in that the flowers bloom directly off the trunks and stems; in full blossom, the tree is limned in color. And of course, my own weeping cherry tree puts on an early spring show.